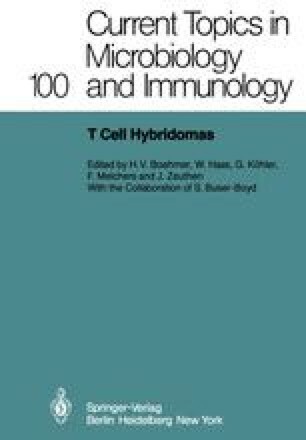 As a laboratory which has been keenly interested in the molecular characterization and mechanism of action of T-cell growth factor (now referred to as Interleukin 2, IL-2) we initially turned to malignant cell lines and T-cell hybridomas as sources of crude conditioned medium from which to purify IL-2. Our hope from such an approach was to uncover cellular sources of IL-2 which would generate a higher titer conditioned medium than could be obtained by conventional protocols involving mitogen stimulation of either splenocytes or peripheral blood leukocytes. We chose to investigate IL-2 production both in cases in which putative producer cells were tested for constitutive lymphokine production and in cultures containing mitogens (PHA, Con-A, pokeweed, lipopolysaccharide) and/or phorbol esters. Because other investigators had previously shown that some murine lymphomas produced lymphokines only after lectin-triggering (I); we felt that a search solely for constitutive IL-2 producer cells might be too limited in terms of its chances for success. Abstracted below are the results of our initial studies together with experimental evidence detailing our recent progress on the biochemical characterization of IL-2. Such characterization has been further enhanced by our development of another hybridoma (of B-cell origin) whose monoclonal immunoglobulin reacts with a determinant present on the IL-2 molecule.